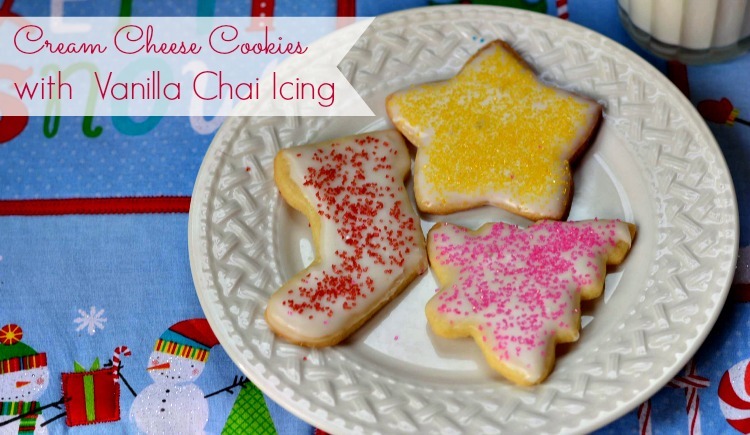 These delicious cream cheese cookies are my families favorite sugar cookie! The frosting is made with vanilla chai tea for a fun flavor combination. 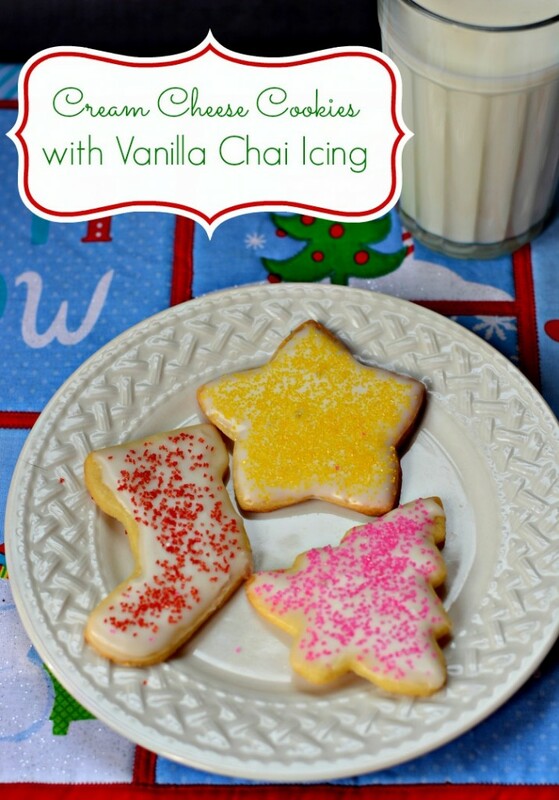 One of my favorite Christmas cookies are cut out sugar cookies with frosting and sprinkles. Nothing quite says Christmas like a sugar laden cookie! 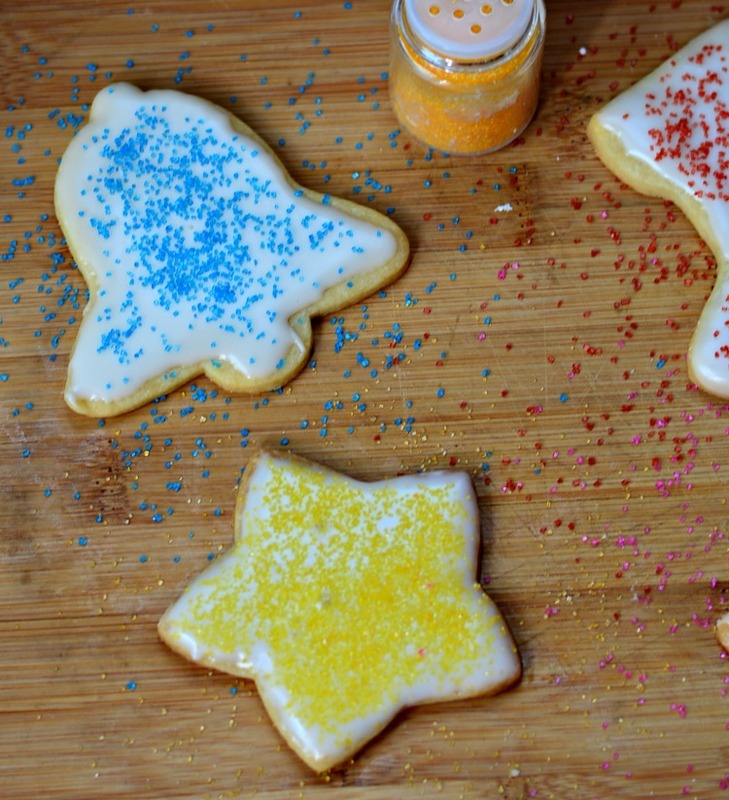 I tried a lot of different sugar cookie recipes that were OK, but not great. 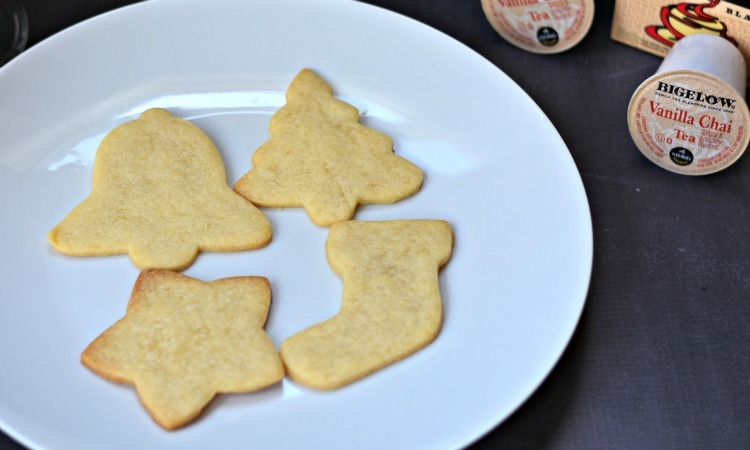 About 5 years ago, I discovered this cream cheese sugar cookie recipe and this was The One. Not only is the dough super easy to make, but the resulting cookie full of cream cheese flavor is outstanding. I usually frost the cookies with cream cheese frosting, which tastes great, but the frosting stays soft so the Christmas cookies aren't easy to stack or give away. Your basic powdered sugar and milk icing works well on these cookies, but I don't like the flavor at all. So I decided to try using Bigelow Vanilla Chai Tea instead of milk. For this icing I decided to use Bigelow chai tea that I picked up at Walmart because of the spices in it. You can brew the tea with tea bags and water, but I love using my Keurig to make tea and had some Bigelow Vanilla Chai Tea K-cups on hand. So I brewed a cup on the medium setting and added a splash of milk. You can really use any sugar cookie recipe you want, but the cream cheese sugar cookie really are amazing! Bake your cookies and let them cool. 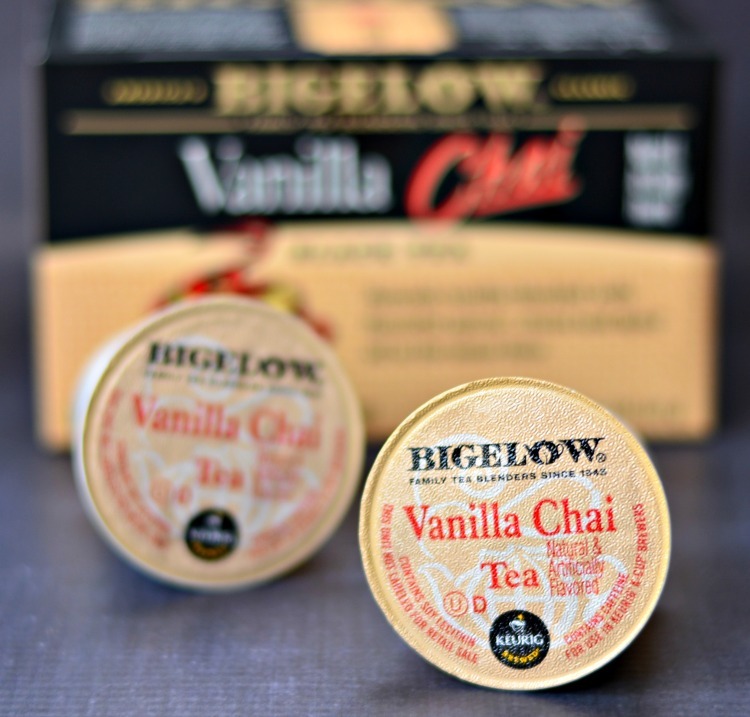 Mix together 1 cup powdered sugar with 2 Tablespoons of the Bigelow Vanilla Chai tea. It should be fairly thick, but still runny. I ice my cookies by dipping them in the icing and kind of swirling them around to get the icing to cover the front of the cookie. A spoon would work well, too or even an off set spatula. It's best to ice one cookie at a time and then add sprinkles or colored sugar or whatever else you want to decorate the Christmas cookies. The icing sets up well enough to gently stack the cookies, but it's not so hard that it gets crunchy. And the flavor the chai tea adds is amazing! So much better than just plain old milk. 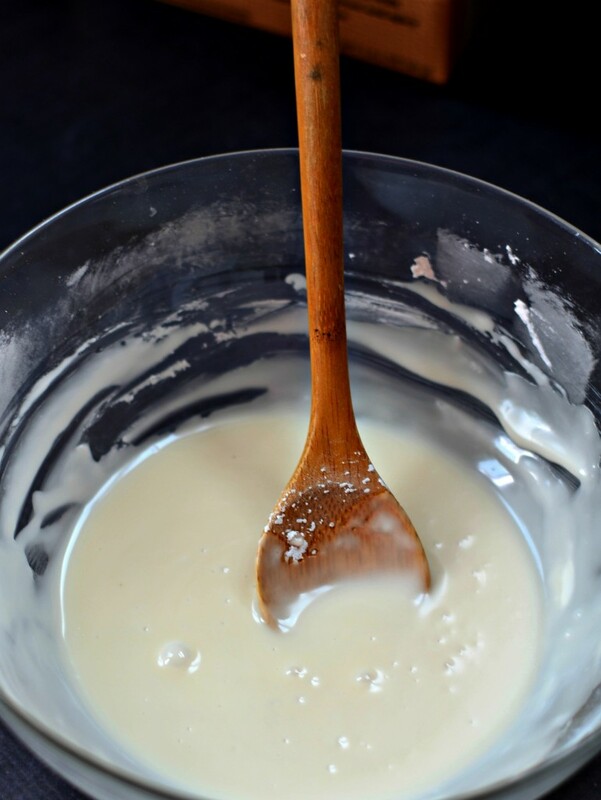 In a large mixing bowl, cream together sugar, butter, cream cheese, salt, almond and vanilla, and egg yolk until light and fluffy about 3-5 minutes. Mix in flour on low just until combined and cookie dough forms. Wrap cookie dough in plastic wrap and refrigerate well until dough is not sticky and easy to roll - usually 8-12 hours. When ready to bake cookies, set dough out for 20-30 minutes to soften. Roll out to desired thickness and cut out with cookie cutters. Bake at 375 degrees for 10-13 minutes or until cookies are lightly browned around the edges. Remove from cookie sheets and allow to cool on a cooling rack. Brew the Bigelow Vanilla Chai Tea K-cup on the medium setting. Add a splash of milk and all to cool. Mix together 1 cup powdered sugar and 2 Tablespoons tea. The icing should be medium thick. Ice cookies and add decorations as desired.